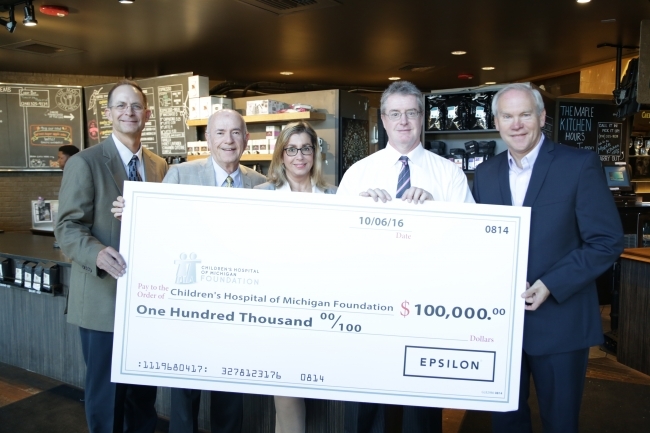 November 10, 2016 /3BL Media/ – Expanding a four-year partnership with Children’s Hospital of Michigan, Epsilon and its parent company Alliance Data, recently made a $100,000 contribution to the Children’s Hospital of Michigan Foundation on behalf of associates in the Detroit area. This gift will help purchase a Digital Real-Time Polymerase Chain Reaction machine that will be used to detect genetic mutations in DNA samples. The cutting-edge, data-driven technology is capable of concurrently processing tens of thousands of tests on a single sample of cells almost instantly, which allows faster, more comprehensive treatment for children in the hospital’s care. The gift will also support the Child Life program, which aims to alleviate the stress and anxiety of a hospital stay for patients and their families by providing a variety of interventions and activities. Epsilon and Alliance Data are committed to supporting the community, and ensuring community organizations have the tools and resources they need to be more efficient and effective in achieving their missions. This contribution not only empowers the hospital to do just that, but also aligns with the companies’ mission to leverage data for good. The relationship between the hospital and Detroit-area associates began four years ago, when associates in Southfield began making teddy bears once a year for children who are undergoing in treatment at the hospital. Last year, associates expanded this support by holding a toy drive for the hospital’s SNOWPILE campaign. Alliance Data® (NYSE: ADS) is a leading global provider of data-driven marketing and loyalty solutions serving large, consumer-based industries. The Company creates and deploys customized solutions, enhancing the critical customer marketing experience; the result is measurably changing consumer behavior while driving business growth and profitability for some of today’s most recognizable brands. Alliance Data helps its clients create and increase customer loyalty through solutions that engage millions of customers each day across multiple touch points using traditional, digital, mobile and emerging technologies. An S&P 500 and Fortune 500 company headquartered in Plano, Texas, Alliance Data consists of three businesses that together employ more than 16,000 associates at approximately 100 locations worldwide. Alliance Data’s Card Services business is a leading provider of marketing-driven branded credit card programs. Epsilon® is a leading provider of multichannel, data-driven technologies and marketing services, and also includes Conversant®, a leader in personalized digital marketing. LoyaltyOne® owns and operates the AIR MILES® Reward Program, Canada’s premier coalition loyalty program, and Netherlands-based BrandLoyalty, a global provider of tailor-made loyalty programs for grocers.